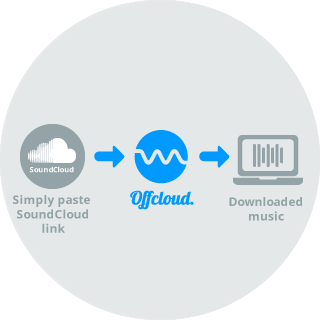 Offcloud enables you to convert any streaming music from SoundCloud to WAV/MP3 & download it directly to your storage of choice. You are probably familiar with the frustration of downloading files from streaming services, like YouTube or SoundCloud. Another great functionality of Offcloud is its ability to download music files directly from any SoundCloud link. Streaming services don’t let you download a file as a whole, but serve the file bit by bit, enabling you to view them simultaneously, without downloading them as a whole. Traditionally, there has been a variety of tools and services, web based or not, that enable you to download sound and video files from the streaming websites. But they are full of annoying ads and sometimes even malicious. Offcloud, as your downloading Swiss Pocket Knife, once again makes the life of downloading easier and enables you to download directly from SoundCloud. You don’t even need to sign up with SoundCloud. It is enough to submit a link from SoundCloud to Offcloud and your music file will be downloaded for you immediately. Offcloud’s ability to capture streams of music and video and convert them to a file that you can download, in combination with its native integration with your cloud storage solutions, like Google Drive, Dropbox or Amazon Cloud Drive, creates a first- class downloading experience that shouldn’t be missed. Downloading content from SoundCloud with Offcloud is free. With a free account, you can submit up to 3 links. Then, for just $9.99 per month, you can enjoy the service in an unlimited fashion.